That's the sound of Chelle kickin' arse! Guess who did cable flyes today???? ME!!!! WHOMP, WHOMP, WHOMP!!! I test my limits each day. Can I increase the weight, can I do more reps (if I can do more reps, I increase the weight, lol), can I do _____? There are so many exercises that I can't do anymore because of the AC joint (or the bursitis, the tendonitis, or the arthritis - depending on the day, take 'yer pick!). But, just because I can't do them today, doesn't mean a day isn't coming when I can. So, I test. Usually at the end of my workout, so that if it's a no-go in a big way, I haven't jeopardized my workout. My workouts lean heavily on modifications - I still work all the muscles, just in a slightly different way from everyone else. I've learned to be ok with that. When I finish, I'll try a couple exercises just to see if I can do them. I have a list of exercises that I love (LOVE) that I really would like to reincorporate into my routines... pushups, normal planks (I have to do them on a medicine ball with bent elbows to eliminate pressure on my shoulder), dips, normal grip chest press (I have to do narrow grip or use the cables), and cable flyes. Of them all, flyes are my favorite. I always called them Sampson's, lol. I miss my flyes. As I've rehabbed the shoulder, rebuilt muscle and stabilization, I'm discovering, a little at a time, that I can do more. Today, I discovered I can do my flyes again! WHOMP! I was a sweaty mess, I'd just completed a 50 minute chest/triceps/shoulder workout, and had tried to do a couple of those experimental exercises (no go), then tried a flye. I ended up doing 3 sets of 10! Low weight, of course (only managed 40 lbs), but WOOOOHOOOO! I must have looked like a lunatic, with my expression bouncing from pain-grimace to grin to pain to grin, but I didn't care! I was so darn excited! So what's with the pain? Well, I'm learning my body. There's a difference between injury pain and rehab pain. If you've ever gone through physical therapy, you know - it freakin' hurts. Your brain screams, STOP, but the therapist just keeps going. That's a necessary pain - that's the kind of pain you have to work through to see recovery. 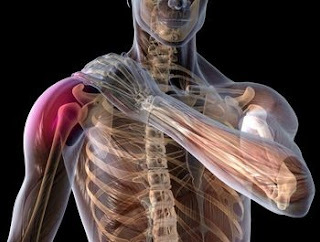 When you've been at it long enough, you notice that by the 2nd set, the joint has warmed up enough that the pain lessens or goes away. Injury pain - now that'll stop you in your tracks. It's not your mind telling you to halt, it's your body - and if you don't listen, it'll stop you cold. Not fun. For me, for my shoulder, the rehab pain is generally constant, deep and achy. Injury pain is sudden and sharp. As I'm working, if I feel that sharp hurt, I stop what I'm doing and either modify or move on. If it's the deep aching hurt, I push through - slowly, gently - but I push through. I imagine that each rep or stretch is rebuilding the joint - making it stronger, better. It's hard work - there may be a few times when that's not sweat running down my face (tears), but I know with everything in me that this pain is worth enduring. I AM going to reach my goals. Now, many hours later, I can already feel the results of my workout - perhaps those extra 3 sets were a bit much, hmmm? lol. Overachiever? Me? Nah! Now if you'll excuse me, I have a date with an ice pack and a bottle of Wobenzyme. I'M SO EXCITED!!!! Yay for progress! That's great! I'm so glad that you are making strides, but I had no doubt you would and will continue to because you're a bad-arse!